I almost decided not to bake this past weekend, but I activated some starter, thinking I might make some sourdough pancakes for breakfast Sunday. But, then, there was this starter, and I thought maybe I'd bake something or other. Well, I might as well have some fresh-baked bread for Sunday dinner, and it had been a while since I'd given a loaf to my next door neighbor who really appreciates my breads. I guessed I'd make some San Francisco-style sourdough to share. I didn't want to be completely tied to the time-demands of my dough, so I relaxed the rigorous procedures with which I had been working to accommodate the other things I wanted to do. I expected the bread to be “good” but maybe not quite as good as last week's bake. I started with my stock refrigerated 50% starter that had been fed last weekend. This feeding consisted of 50 g active starter, 100 g water and 200 g starter feeding mix. My starter feeding mix is 70% AP, 20% WW and 10% whole rye flour. I activated the starter with a feeding of 40 g stock starter, 100 g water and 100 g starter feeding mix. This was fermented at room temperature for 16 hours, then refrigerated for about 20 hours. I then mixed the stiff levain. Dissolve the starter in the water. Add the flour and mix thoroughly until the flour has been completely incorporated and moistened. Ferment at room temperature for 16 hours. In a stand mixer, mix the flour and water at low speed until it forms a shaggy mass. Add the salt and levain and mix at low speed for 1-2 minutes, then increase the speed to medium (Speed 2 in a KitchenAid) and mix for 5 minutes. Add flour and water as needed. The dough should be rather slack. It should clean the sides of the bowl but not the bottom. Transfer to a lightly floured board and do a stretch and fold and form a ball. Place the dough in a lightly oiled bowl and cover tightly. Ferment at 76º F for 31/2 to 4 hours with a stretch and fold at 50 and 100 minutes. Pre-shape as rounds and rest, covered, for 10 minutes. Shape as boules or bâtards and place in bannetons. Place bannetons in plastic bags. Proof at room temperature (68-70º F) for 1-2 hours. Cold retard the loaves overnight. 45-60 minutes before baking, pre-heat the oven to 480º F with a baking stone and steaming apparatus in place. Transfer the loaves to a peel. Score the loaves as desired, turn down the oven to 460º F, steam the oven, and transfer the loaves to the baking stone. Turn off the oven, and leave the loaves on the stone, with the oven door ajar, for another 15 minutes. Transfer the loaves to a cooling rack, and cool thoroughly before slicing. Note: Because these loaves were smaller than those baked in “Take 3,” the oven temperature was hotter , and the baking time was shorter. I also wanted a slightly darker crust, which this modification accomplished. 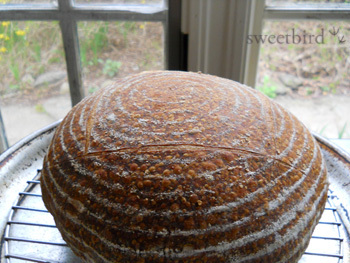 The crust was thick and very crunchy but not “hard.” The crumb was more open than my last bake. The crust had a sweet, nutty flavor. 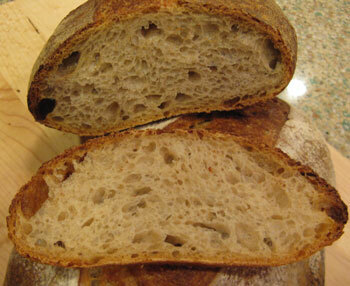 The crumb had sweetness with a definite whole grain wheat overtone and a more pronounced acetic acid tang. It had a wonderful cool mouth feel and was a bit more tender than the last bake. This bread was close in flavor and texture to the best tasting bread I've ever had which was a half kilo of pain de campagne cut from an absolutely huge miche in Les Eyzies, France some 15 years ago. It's a taste I've never forgotten and often wished I could reproduce. I need to make me a miche like this! David, as always your bread looks fantastic. Beautiful open crumb and perfect crust. I'm working on liquid levain stage tonight. I have never tried your technique of converting a firm starter to a liquid and back to a firm before, so I am anxious to see the final result. You and Glenn and David G - all making this bread this weekend. I'm really looking forward to a gala show and tell about Sunday night! I just realized I am actually following your previous post where you made the walnut bread also, so I didn't refrigerate the liquid levain and instead just mixed the firm starter levain this morning. So I guess I won't have the exact results as you on this go around. I have to decide if I should follow your 2 hour autolize or just the standard 20 minutes when mixing the final dough per your previous post. Actually I now also realized the post I am following you wrote after this one I believe......so which one do you like better? or am I just confused? I'm sure either one will turn out good. The method used in the earlier "ver. 4" post produced a slightly more sour bread, but the difference was quite small. Both were delicious. I'm betting yours will be too. I'm making another batch myself this weekend with yet another minor procedural modification - skipping the liquid starter stage altogether and building the levain from a firm starter. The bread will be baked Sunday. I may have to wait until next weekend to do this. My refrigerator is on the fritz and I have to have it fixed on Monday. I'm afraid of what will happen if the temperature is too warm and then it has to sit out on the counter for who knows how long before being put back in to rest until I can bake it tomorrow night. I will certainly give it a go again when I can. I've decided to give it a go tonight. I will follow your procedure up to forming the loaves and will put the dough in my smaller drink refrigerator to bulk ferment. Tomorrow night I will form them into loaves and bake them. Strange thing is that I didn't have enough firm Levain for some reason. I am pretty sure I followed your amounts exactly, but maybe I miscalculated. I just added a little bit of the original firm starter I had in the fridge. 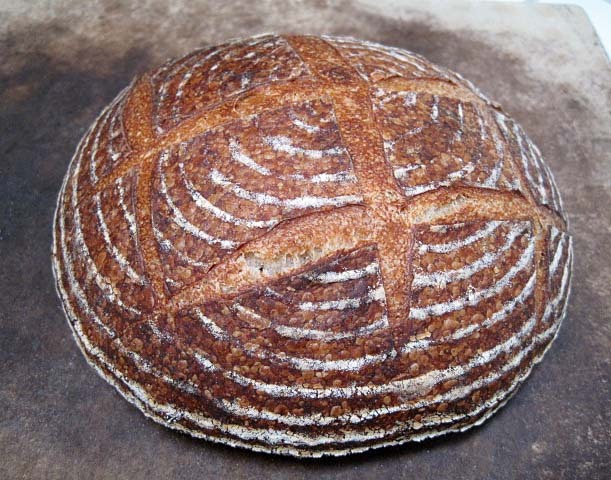 The bread looks really good, and sounds very tasty from your description and comparison. A long and slow ferment of your starter must be important to achieving this. By the way, I think you must have used 200g of your "starter feeding mix" in order to maintain your stiff levain in your procedure above? I'm not sure to which step you are referring regarding my starter feeding. I think what I wrote was accurate. My feedings took the starter from stiff to liquid then back to stiff, for the levain. If I missed something, please help me identify it. I too was confused by the reference to "stiff starter"
Although Andy was cleared up, I'm still confused by the reference to "stiff starter" in the step to create "stiff levain". If I started out with a 50% starter, then thinned it to 100%, that's what I am adding at this step so it's a poolish, by no means stiff. Anyway, trying this now as baguettes. I predict that thick or thin, the results will be excellent. I'm afraid the post has TMI. I described my procedures from the point I activated my starter, but you should really start this recipe with a stiff starter that you then use to mix the firm levain. Let us know how your baguettes turn out. Quick thinking of you to note things down for us, David! Thanks for that. 2 hours autolyze? ... last time i've tried autolyzing that long (though i made dough water quite warm, don't know why) the final dough was very slack and seem to desintegrate. I think the key here is room temp water? Absolutely fantastic results, David! i think you've achieved the flavor you seek, and beyond. I can sense the flavor from your description (amazing how sourdough seem to taste the same everywhere on this planet). Maybe moon sourdough (lunar SD) would taste different? :) any astronaut? see if the levain was in it. Simply flour and water... patiently waiting for David to add the lifting power. So there won't be much degeneration. Love that crust! Beautiful! Thanks for the compliment, Mini! I think it's useful to remind everyone that gluten formation occurs when the two component proteins are exposed to water. So this is occurring during the autolyse. Mixing after the autolyse organizes the gluten strands and promotes cross-strand bonding in a way that it can make cells to trap the CO2 generated by fermentation. The 2 hour autolyse was to give me time to get to the Farmer's Market and the grocery. I find this long autolyse results in a dough that needs very little extra mixing to achieve excellent gluten development and a very extensible dough. It was not at all too slack or degenerated. The water I use is actually cooler than room temperature. You are probably correct that that is important. no I hadn't followed your complete feeding schedule, my fault. Yes, it's clear now, as you've pointed out going to liquid, then back to stiff. The top photo that popped up when I opened your blog tells it all, really. Such perfect, golden crust colour... I wouldn't want it any other way. I paid particular attention to your crust, David, because I've been struggling with mine lately. A little over a year ago, I moved to a new apartment and didn't bring my starter with me. To be honest, I felt like a break from bread baking, and focus on some other interests instead. I'm now back among the merry home bakers, with a new rye starter that's only a couple of weeks old. In my new apartment, I have a newer, larger and probably more heat efficient oven than the one I was used to from my old place. I didn't really think much about it at first, and baked the first few loaves at the same temperature that I used before (i.e. high temperatures, starting at 250dC and ending up at around 235dC). The resulting loaves sang when they were hot from the oven, but the crusts turned soft and unappetizing as soon as the bread cooled down. After some trial and error (and consulting Calvel, Hamelman and Suas), I ended up baking this weekend's loaves at a lower 220dC for a slightly longer duration, and the crusts are now exactly as I remembered them; crackly, crunchy and full of flavour. I was, and still am, surprised by the difference the baking temperature has on the crust; with my new oven, I need to bake at lower temperatures to avoid trapping too much moisture inside the crumb of the loaf. If baked too hot, the crust will start setting up too early (no matter how hard I steam, the crust set up too early), limiting loaf volume and trapping moisture inside the loaf - the excess moisture would soften and ruin the crust as the bread cooled. With a some more practice and fine-tuning, I hope to someday approximate what you achieved here, David. Thanks again for the inspiration! Hmmm ... Have you checked the accuracy of your oven's temperature? I wonder if differences in oven venting play a role in your need for a different temperature setting. Thanks for your kind words. Your breads (not to mention your pastries) have certainly inspired me! I'm looking forward to seeing more of them. you may be getting pretty close to your hoped for SFSD with this version. What do you think? This was a fine bake for sure. 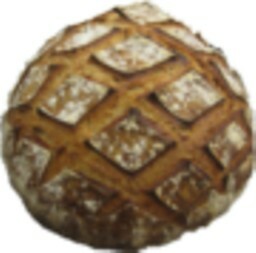 I could use your insight into the levain build. I have been refreshing my starter for 12 hours (at less than half the final levain build amounts) and refrigerating it for 8-12 hours, before building the final levain the next morning which only seems to take about 4-6 hours or so on the counter before it doubles again and ready to use at about 72 F. These times are much shorter than this version of your SFSD. I have also tried retarding the levain after the final build rather than the previous refreshment. 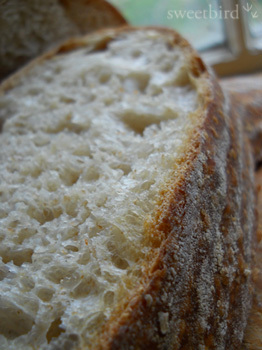 That too seemed to help the sour of the bread but didn't seem to do much for the crumb openness. Is your final levain collapsing in the last 16 hours it spends on the counter? I think mine would collapse if it spent that much time on the counter after the 2nd refreshment but I haven't let it sit that long to find out.. I have been using 70% AP and 15% eacb WW and Whole Rye as my starter feed which is fairly close to yours in the same % of water. I don't know if this slightly more whole rye and less WW would make much of a difference or not. Your crumb seems more open though. I'm going to have to try letting the levain build take longer, like you did this time and see if that helps. I found that your 3 hr - 85 F final proof with high humidity really helped the taste and brought out the sour of the bread remarkably. Your experiments are very interesting and helpful. I can say that a younger starter will be less sour than a mature starter. I can't give you exact times. My starter has not collapsed in 16 hours at around 68 degrees F. But note that, for the final build, I use bread flour (12.5% protein). It has expanded 3-fold in 12 hours. After that, expansion slows down, but, obviously acid production continues. 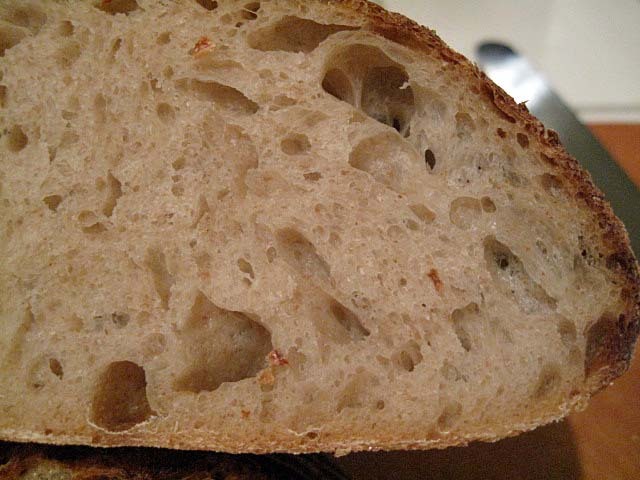 The crumb structure is influenced by mixing (including S&F's) and bulk fermentation mostly. Dough handling can also make it better or worse. 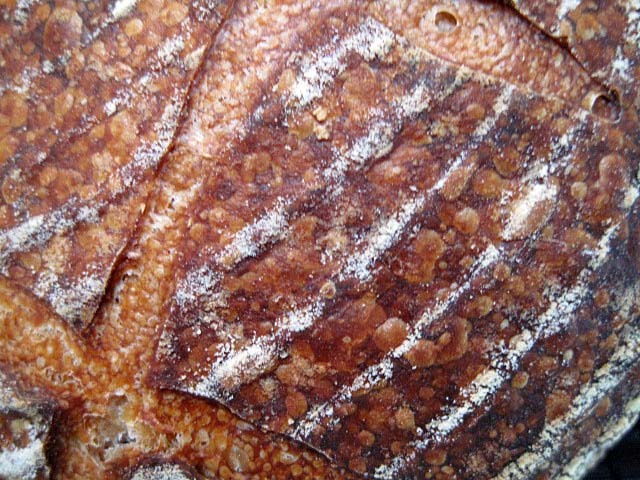 The main contribution of the levain to crumb structure is the acid, which strengthens the bonds between gluten strands. I think that's important, but very much secondary to mixing and fermentation in importance. My bread baking has improved remarkably I would say, mainly because of your experiments, explanations and recipes. I missed the bread flour in the final build. Maybe my leavain wouldn't collapse afer 16 hours on the counter as I thought. I know it doesn't collapes after 12 hours on the counter and 4 in the frige after final build. I will pay more attention to my handling of the dough and its gluten development too. I'm monitoring the stiff levain performance carefully since mixing it--I think that's what you call the "final build" in your post immediately above: you're answer to dabrownman--I found the the stiff levain I mixed at midnight, more than doubled this AM at 6:00 o'clock; but by 9:00 o'clock it was beginning to collapse. Room temperature has been between 72°F and 78°F; it's spring-time in northern Florida. I know from past experience, that by re-mixing the levain when it peaks it begins to expand again. I remixed, and, true to experience, I'm now at 14 hours, and the remixed levain is still re-expanding. I've suspected for some time that the way I maintain my starter, and build formula-ready levain favors yeast development. At best, the bacteria population in my starter is at survival levels. That's, perhaps' the primary reason I'm making this bake: to see if I can evoke more than a hint of sourness from my stock. Given even a muted success, it won't become more than an ocassional bake. My wife sometimes complains a batch of sourdough loaves are too sour for her liking. Nonetheless, I'm having fun. Stay tuned. It's so great to be able to get close to your idea of “perfect bread". As someone who does long autolyse regularly, I am not surprised that better flavor was coaxed out by the 2 hour rest. Great work! Everything about this bread looks like perfection David! I am inspired. I am particularly impressed with the color of your crust, mostly because I have not been able to get that russety glow since I switched from electric to gas oven. Since I believe you cook with gas, I'd love your input. I haven't changed my approach electric to gas with the exception that I now switch on convection after 10 or 12 minutes. My set up is a fibrament stone on the bottom rack, and then two alumunum pans preheated with lava stones on top rack. Just before loading the loaves I add a towel to one pan that has been dunked in boiling water, I add a second hot wet towel to the other pan just as I complete loading the loaves. I've never cooked with a gas oven before...should I have the steam pans below the stone? Is there some other adjustment you suggest? I cook on a gas stovetop, but my oven is electric. Since I believe the crust color reflects the Maillard Effect, I can't think of why gas vs electric ovens should be different. I haveused the same formula as there is no other variable besides the different ovens. I even retarded overnight so the mail lard effect should not be an issue. I'm greetingfood color on the bottom... Maybe is should just serve it upside down. Anyway I will try your sf sd and report results. I really can't help you with gas ovens, since I have no experience with them. However, in general, if you want a darker crust, bake at a higher temperature for a shorter time. See hansjoakim's reply in this topic regarding the adjustments he had to make with a change in ovens. As hansjoakim said, I was sold as soon as that picture popped up. What a gorgeous loaf, David! And I love that you relaxed your schedule so you could pop out to the Farmer's Market, etc., and you still ended up with such a world-class result. I was trolling around trying to decide what to do with my active starter and I think I've just found it . . . thank you!! If you do make this bread, please let us know how it turns out for you. I've continually tweaked this formula. Now, I'm interested in its reproducibility, both in my kitchen and in others. 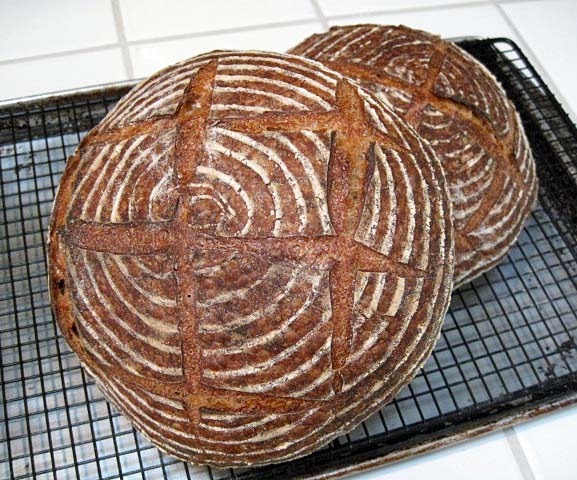 One of the very satisfying attributes of the San Joaquin Sourdough has been that so many bakers have been so happy with their own bakes using my formula. I hope this sourdough has the same reproducibility. I've got things underway and just did my second stage feeding (the 40g + 100g + 100g) this morning at 6. It was then that I decided to sit down and map out the rest of the dough schedule and realized that on bake day (Friday) I have to be away for most of the day! So I will have to tweak. I can either stretch out the second stage feeding and leave it in the refrigerator for an additional 20 hours or so, or stretch out the final build/stiff levain by refrigerating it. I'm thinking I'll do the former, which would be similar to refrigerating any active levain or starter for a day. So . . . I'm sorry to not exactly replicate your schedule and test out the reproducibility, but I will report back on my unintended variation. And then I'll plan out another time to test the formula exactly as written. Thank you again, David! I also took 200 gms before I shaped it and baked a pizza last night - delicious! I'll be making this one many, many times more -- thank you so much, David! Looks like you nailed that bake. That is one gorgeous loaf of bread! The times I gave in the OP were more descriptive than prescriptive. Your schedule is not the same as mine. For that matter, my schedule isn't the same from week to week. We adapt. If the bread is good, whatever you did worked. I'm really delighted you made it and enjoyed it. Just had to report back once more. I'm hearing a lot of "when are you going to make THIS one again?"! When we are asked, "Why do you bake bread?" most cite some mix of aesthetic and scientific rewards, but a lot of the satisfaction has to do with nurturance. So when our family appreciates what we bake - especially when it's with some enthusiasm - it really touches us. Thanks for sharing! That made my day! I agree completely, David. It's the best side benefit to what we bakers love to do - to have others love the results! And want more! I'm happy to provide it. David, just gorgeous, and I'm smiling thinking of you recreating a special loaf tasted long ago :) Beautifully done. Any thoughts on which details may have led to the more open crumb? I'm wondering if maybe it could be due to a softening of the gluten during the long autolyse and the 85F final proof. 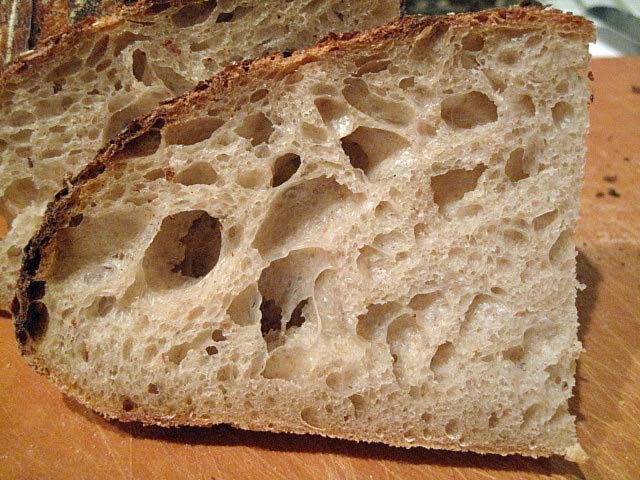 I think the more open crumb was due to several factors: 1) The dough was somewhat more hydrated to start with. This was due to very slightly higher hydration and the variable absorbtion day to day of flour. We've had rain, and the ambiant humidity has been higher. 2) I developed the gluten more fully. I had a very good window pane after the machine mix and still did two stretch and folds. 3) Fuller fermentation and proofing. I really thought I had over-proofed the loaves before I baked them, but I had formed the boules really tight, and the oven spring told me the proofing was spot on. Those are stunning, inside and out. I've always believed that it's better to be lucky than good (but that's because I'm not usually all that good, but sometimes I get lucky). You know, we Gemini have difficulty making choices like that. So we strive to be both lucky and good. I am so happy for you, that you baked a bread as good as what you remember from so many years ago. 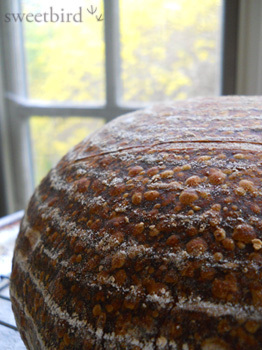 Thank you for sharing how you made it - this looks and sounds like wonderful, wonderful bread. It is very good. I'm hoping to be able to reproduce it reliably. The procedure fits nicely with my usual weekend routine which makes it easier. On the other hand, it takes planning ahead. To bake the bread Sunday, you have to start by refreshing your starter Thursday evening. I couldn't resist trying to bake this bread; getting underway late Wednesday evening, and then having the pleasure of tasting the bread with tonight's supper. 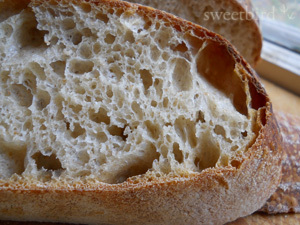 We absolutely loved this bread and like Janie, I will be making this one again! Thank you again for writing about your process. ...mmm, this bread is really, really good! Your bread looks great, breadsong!